The "Impact: Earth!" 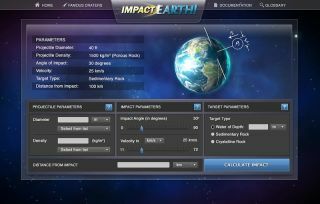 website allows users to input the diameter and density of an asteroid, the impact angle and velocity, and whether the projectile will hit water or rock. A new website lets astronomers ? andanyone who likes towatch stuff blow up ? calculate the damage a comet or asteroid wouldcause ifit hit Earth. The interactive website, calledImpact: Earth! (available atwww.purdue.edu/impactearth), is scientifically accurate enough to beused by theDepartment of Homeland Security and NASA, but user-friendly enough forelementary school students, according to the researchers who developedit. "There have been big impacts in thepast, and we expectbig impacts in the future," said Jay Melosh of Purdue University, wholedthe creation of Impact: Earth!. "This site gives the lowdown on whathappens when such an impact occurs." Space-rock fragments as large as asedan hurtle into theplanet a few times each year, but they usually burn up as they entertheatmosphere. Massive impacts are rare ? butincredibly powerful anddestructive. When the 9-mile-wide (15 km) Chicxulub object smashed intoEarth65 million years ago, for example, it set off a cascade of events thatscientiststhink killedoff the dinosaurs and many other species. Asteroids don't have to be as big asChicxulub to leave amark. Arizona's Barringer Crater ? nearly a mile (1.6 km) wide ? isevidence ofan impact 50,000 years ago from a nickel-iron space rock estimated tobe 164feet (49.7 m) in diameter. "Fairly large events happen aboutonce a century,"Melosh said. "The biggest threat in our near future is the asteroidApophis, which has a small chance of striking the Earth in 2036. It isaboutone-third of a mile in diameter, and the calculator will tell what willhappenif it should fall in your backyard." The website allows users to enter afew parameters, such asthe diameter of the impact object, its density, velocity, angle ofentry andwhere it will hit the Earth. The calculator then estimates theconsequences of theimpact, including details of the atmospheric blast wave, groundshaking, thesize of any tsunami generated, fireball expansion, distribution ofdebris, andthe size of the crater produced. According to Impact: Earth!, if anasteroid of similarcomposition to the one that caused Barringer Crater ? but twice as big? hit 20miles (32 km) outside of Chicago, the impact energy would be equivalentto about97 megatons of TNT. The resulting crater would be almost2 miles (3.2 km) wide,and the impact would ignite a fireball with a 1-mile (1.6-km) radius. Amagnitude 6 earthquake would shake the city approximately six secondsafterimpact, the air blast would shatter windows and the Windy City would becoatedin a fine dust of ejecta. The site states that impacts of thissize occur roughly onceevery 15,000 years. Impact: Earth! is an updated versionof an impact calculatorMelosh created with some colleagues about eight years ago. The newsite'sgraphic interface makes the site easier and more fun to use, Meloshsaid. "There were a lot of requests forcalculations oftsunamis that would be produced from an ocean impact, and we've addedthat," said Gareth Collins of Imperial College London, who worked withMelosh and others on the new version. "In addition, the program nowvisually illustrates the information the user enters, and we plan toconnectthe program with Google Earth to show a map of the effects." Governmental agencies, including theDepartment of HomelandSecurity, NASA and the U.S. Geological Survey, use the site, Meloshsaid. Theprogram is available in multiple languages and also is used by foreigngovernmentalagencies. "This calculator is a critical toolfor determining thepotential consequences of an impact," said John Spray, director of theplanetary and space science center at the University of New BrunswickinCanada. "It is widely used by government and scientific agencies, aswellas impact research groups and space enthusiasts throughout the world." The calculator has also been avaluable tool in sparkingyoung students' interest in science, according to Melosh. "The calculator has been used byteachers and studentsfrom kindergarten through high school, both for school projects and forfun," he said. GreatestMysteries: What Causes Mass Extinctions?